St. Paul’s (Staten Island, New York, 2015). 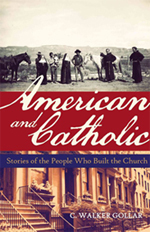 Described on the cover as “the definitive concise guide to the history of the American Catholic Church,” this book lets readers know at the outset that they are not reading a comprehensive tome covering all facets of American Catholic history. “American and Catholic” is not all negative, but it is blunt, especially when Gollar writes about Catholics, including bishops and Jesuits, as slave owners. Catholic readers might ask, “Do we really need to know that?” Those who welcome an unaltered telling of their stories will want to know. Because it is a concise book, Gollar sometimes devotes only a few pages to events and people who are part of the Catholic story. The immigration of the Irish and Germans in the early 1800s provides a chapter filled with stories of perseverance steeped in faith. There is little detail on many of those named, but Gollar’s approach can pique readers’ interest to the point where they may want to read more, be it about a particular era, person or event. While Gollar’s stories are of the “warts-and-all” variety, Clare Smith’s “Forty Catholics” provides a compilation of short, flattering profiles of Catholics she believes shaped the world. 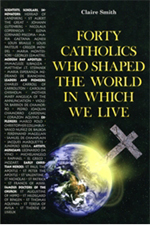 Thanks to information culled from various sources and footnoted at the end of each profile, readers receive introductions to explorers, artists, musicians, leaders, pioneers, “modern-day apostles” and others for whom Catholicism was an important part of their lives, according to Smith. She writes, “This project devotes attention to the faith, love, prayer, devotional practices and hopes for eternal life that influenced the work and vision of these innovators.” Some Catholics one might have expected to make the 40, but who didn’t, e.g., Blessed Teresa and Archbishop Fulton J. Sheen, are listed on Smith’s “index of notable Catholics.” They are joined by “notables” such as Danny Thomas and Ricardo Montalban. Yet Blessed Frederic Ozanam and St. Elizabeth Ann Seton did not make the list. While emphasizing the piety of each in a manner reminiscent of the history textbooks found in Catholic elementary schools in the ’50s and ’60s, Smith does occasionally acknowledge flaws among her chosen, e.g., Marylander Charles Carroll of Carrolton, the only Catholic to sign the Declaration of Independence, was a slave owner. However, more often one will find only glowing accounts of her subjects and their works. Whether or not readers agree with Smith’s 40 Catholics and their impact upon the world, the text might provide them with a person or two about whom they would like to do further reading. Olszewski is general manager of the Catholic Herald, a publication serving the Catholic Church in southeastern Wisconsin.